International – Win! Win! Win! Some of you will wonder what the hell, but I apologize. I need to rebuild. All my ‘business’ money is gone so prizes will be small once again until I come to understand this wonderful world of blogging. I do hope you’ll stay around. It’s been quite the adventure so far. I’m technically not part of the back to school crowd anymore. My last daughter is in college, but she moved out years ago. I just pick her up and take her to supper once a week. I remember the routine well though. Around here, back to school isn’t until the day after Labour Day for most school boards. The French Board starts about two weeks earlier. I am aware that other countries start sooner. No matter when school starts, we all go through the same mornings. Know any tips/hacks that make school time routines run smoother? Please share them in the comment section. Here are a few tips I’ve gathered over the years. Get your house organized after a busy summer. Especially before back to school shopping. Get back into routine with sleep the week before. It really is harder than it sounds. Walk the route to school a few times/Go to bus stop. Ensure you point out any dangers. Delegate. Even kindergartners should be involved in the morning routine. A monthly calendar makes everyone’s life easier. There’s no doubts and second guessing when everything is easily accessible. I still prefer paper, but there are many, many apps to help. Cook meals in advance on the weekends. In August I would always stock my big freezer with easy dinners so the first couple months ran smoothly while we tried to adjust to busy new routines. Every time I would make a supper I would make three and freeze two. Do all you can in the evenings. Make the mornings as easy as possible. All devices are out of the bedroom. It’s just best overall. Find time to laugh daily. No over scheduling. Plan 20 minutes each day for yourself. Use a special clock for homework time. It’s not you they complained to. Hopefully you found some useful tips and have a stress free back to school start. Now let’s get to winning! Please take the time to visit each hop stop. Each blogger has their own awesome prize. The linky is located at the end of this post. Prize: $5 CDN Paypal Gift Card Rules: 18+, WW – Ends September 17th, 2018 11:59 pm. You can enter daily. If the prize is unclaimed after 48 hours of being contacted a new name will be drawn. The winner will have to correctly fill in our Winner’s Confirmation Form which includes a skill testing question to win. We can not be responsible for lost mail. Lists can be cancelled at any time but bare in mind you need to be following anything you claim to be following to win. ​Facebook, Instagram, Pinterest and Twitter are not participating in this contest. There could be up to a 30 day turnaround on the prize. No PO Boxes. BTW comment below sharing your tips for smooth back to school mornings or tell us what fun things you did this summer. You will earn 5 entries in the giveaway for doing so. Hope you’re having a great summer! You know it’s starting to wind down when it’s back to school time. 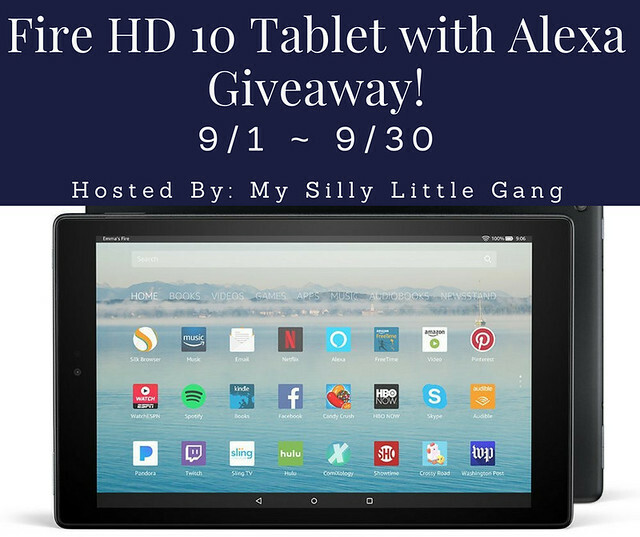 This giveaway is hosted by The Kids Did It and The Mommy Island. We have done 8 giveaways with them. We truly appreciate their efforts. They can answer any questions about the prize. Win! Win! Win! is only helping promote this giveaway. Thanks for participating and good luck! Every parent knows that kids’ brains are like sponges, soaking up drops of information and words (even the four-letter ones we don’t always want them to). But did you know that 85percent of what we learn, we learn by listening? According to the Audio Publishers Association, listening increases reading accuracy by 52 percent, and combining print and audio increases memory 40 percent over print alone. Audiobooks.com is making it easier (and more fun!) for kids to expand their vocabularies, increase reading speed, improve fluency, and teach pronunciation. No matter what genre your child gravitates towards, Audiobooks.com has lots of exciting kids content that can be enjoyed while waiting for appointments, before bedtime, and during car rides (the age-old question “Are we there yet?” will become a thing of the past, even for reluctant readers). Just in time for back to school, make any time learning time. One lucky entrant selected by the entry form will receive a FREE one-year subscription to Audiobooks.com. That means 125,000 premium audiobooks of your choice that you can instantly stream and download to your smartphone, tablet, or computer. Follow them on Facebook, Twitter, and Instagram to get listening tips, recommendations, and more. Open for entry from September 4th to September 18th, 2018. Open to entrants in the US, 18 years and older. The selected winner will have 24 hours to respond to the notification email to claim this prize or a new winner will be selected. Sponsor is responsible for prize fulfillment. Best of luck! I know, it’s hard to believe that summer is almost over! Win anything this summer? Let me know in the comments please. This giveaway is hosted by is Michigan Saving and More and Saralee’s Deals, Steals, and Giveaways. We have done many giveaways with them now. We truly appreciate their efforts. They can answer questions about the prize. Win! Win! Win! is only helping promote this giveaway. Thanks for participating and good luck! This giveaway is hosted by My Silly Little Gang. We have done 5 giveaways with them. We truly appreciate their efforts. They can answer questions about the prize. Win! Win! Win! is only helping promote this giveaway. Thanks for participating and good luck! Hope you had a great summer! Ours was tumultuous but they say what doesn’t kill you makes you stronger. This giveaway is organized by The Kids Did It and The Mommy Island. We have done over 7 giveaways with them. We truly appreciate their efforts. They can answer questions about the prize. Win! Win! Win! is only helping promote this giveaway. Thanks for participating and good luck! Are you ready to win big during our Oh! The Places You’ll Go! 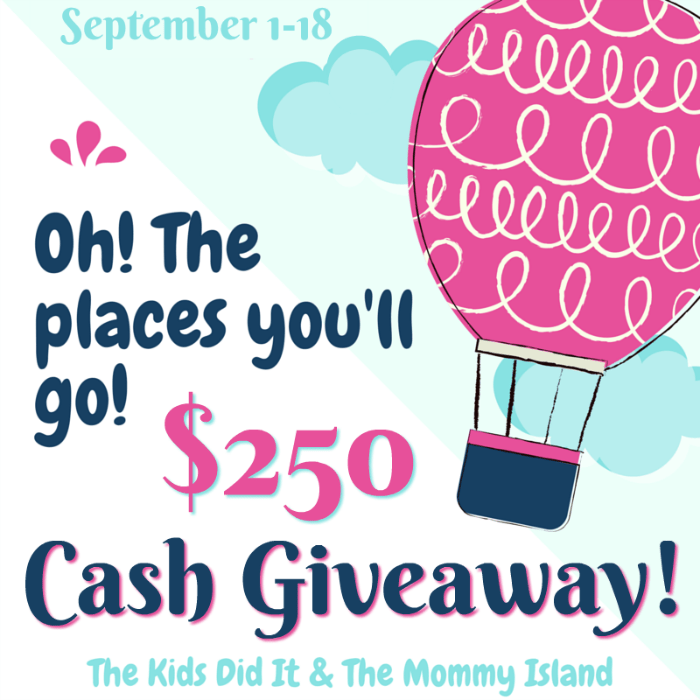 $250 Cash giveaway event celebrating back to school? You have the option of choosing between $250 PayPal Cash OR a Gift Card of choice! This event was organized by The Kids Did It & The Mommy Island and sponsored by fabulous bloggers, authors, and Etsy shop owners! Plunge your way through the entries during our September Cash Giveaway Event! ONE entrant will be selected from the entry form to win $250 PayPal cash OR a $250 gift card of choice. Open for entry WW, 18 years and older from 09/01/18 at 12:01 a.m. ET thru 09/18/18 at 11:59 p.m. ET. No purchase necessary. Void where prohibited. A winner will be chosen after/around September 19, 2018. The winner will have 24 hours to respond to notification email to claim their prize or a new winner will be selected. See Rafflecopter for official rules. The Kids Did It & The Mommy Island ARE responsible for sending the winner their prize via PayPal or e-gift card. The winner has the option of choosing between PayPal and an e-gift card of choice. Prize may be less than $250 if you choose a gift card with fees. Any fees associated with PayPal are the responsibility of the winner and will be deducted from the total prize amount. This giveaway is hosted by Michigan Saving and More. This is our 15th event with her. She is the host and solely responsible for the prize. Win! Win! Win! is only helping promote this giveaway. If you haven’t heard of us before, Win! Win! Win! is a new contest site where you can really win! Please take some time and check us out after your enter this awesome contest! Thanks for participating and good luck! Welcome to the Zerowater For College Bound Kids Giveaway! Q. How is ZeroWater® Different? Welcome to Win! Win! Win!’s Twitter Rollover! Congratulations to Jerry M. from Illinois! He responded in time and wins of this cycles Twitter Rollover. So he won the $12! This means the Rollover has reset to $10. Twitter Rollover is a progressive prize giveaway that grows by a dollar if unclaimed after 12 hours. The prize starts at $10 and returns to that when the prize is claimed. As our blog grows so will the prizes. Simply add your twitter name to the linky list below and keep your eyes peeled to your Twitter. Winning can be that easy! We will be using random.org to select our winner from the linky list. We are still thinking of doing the draw with Facebook Live, would you watch? Please tell us in the comments below. Rules: This round ends 08/08 at 11:59 PM, 18+, WW – $10 CDN PayPal Gift Card, you have 12 hours to complete and return the Winner’s Confirmation Form, which includes a skill testing question. Prize goes up by $1 if unclaimed. If you would like notification of when our Twitter Rollover resets, click here. You can cancel at anytime, just follow instructions in the email. Follow the example below to add your twitter link. If you need more instruction on how to get your Twitter URL or on how to copy and paste click here.